An £8 million scheme to revamp the Old Steine area has been approved by councillors despite opposition from businesses and residents. One councillor said that to go ahead with the current plans for the scheme, known as ‘Valley Gardens phase three’, would be ‘sticking two fingers up’ at the city. But despite public opposition, supported by local Conservatives, a Brighton and Hove City Council committee voted to approve the latest design on Thursday evening (February 7). The opposition Tories wanted a pause and a fresh look at the plans but Labour and Green members of the council’s environment, transport and sustainability committee, voted the plans through. There was a delay before the start of the committee’s debate at Hove Town Hall when members went into private session to discuss a legal challenge to the scheme. During the discussion about the scheme to redesign the area from Edward Street to the Aquarium roundabout, Conservative councillor Lee Wares raised concerns about Duke’s Mound, buses companies supporting a different design for the west side of Old Steine and increased taxi fares along Madeira Drive. He was told that Duke’s Mound would be widened to allow for lorries to turn out of Madeira Drive as the pier end of the road would be one way, which Councillor Wares described as ‘project creep’. He said that the impact on taxi fares had not been taken into consideration. A Brighton and Hove taxi driver’s experiment was cited as showing that a fare from Volk’s Tavern to the Aquarium roundabout would increase by £7 due to Madeira Drive become entry-only. Councillor Wares said that bus companies were making the best of what they were offered rather than the proposals being the best option. He said: “Someone needs to listen to what our city is telling us. “Let us not do something that will take decades to fix. There is never going to be enough money to fix the direction this is going to take. Councillor Wares said that the council was not listening to the people who had come to the meeting to raise their concerns. Drivers would not give up their cars but go elsewhere to do their shopping, he told the committee. Veteran Conservative councillor Garry Peltzer Dunn spoke about the route that people would have to take if they were leaving Little East Street and wanted to go west. The advice was to turn up Lower Rock Gardens and travel via Edward Street to return to the seafront. Councillor Peltzer Dunn said: “The number of extra vehicle movements has not been taken into consideration. He was told less than half a per cent of vehicles make the journey. Green councillor Leo Littman said that different groups were lobbying for and against the scheme. He described the council as being pushed to decide on the scheme, blaming the Labour administration for “sitting on its hands” for two years after pledging to kill off the project in its 2015 election manifesto. Having heard complaints that people deciding not to drive into town and the effect on the economy, he quoted Friends of the Earth, saying: “Ever since I have lived in Brighton tourism bosses have predicted the demise of the economy every time a minor restriction on cars is made. Labour councillor Peter Atkinson said that the money from the Coast to Capital Local Enterprise Partnership had to be drawn down by March 2021. 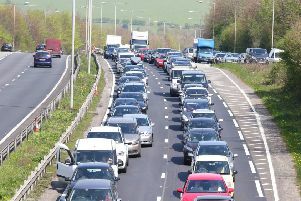 He said: “We need to make it clear, right from the start, that these proposals are not specifically aimed at motorists. Neither are they anti-motorists. They are modelled on existing traffic volume. The project has £6 million of funding from Coast to Capital. Labour and Green councillors voted to send the project through to the next stage, with officers working on the detailed design stage to complete the project by 2021. Changes introduced since the public consultation, which received more than 800 responses, included introducing a southbound priority lane for buses, taxis and coaches, footpaths to create better pedestrian links between North Street and St James’s Street, loading bays and parking bays for doctors and blue badge holders. Conservatives asked for a report to be bought before the committee before any contracts were signed. This was defeated by Labour and Green councillors. A Green request asking for independent advice in response to the legal challenge was approved unanimously. After the meeting, Labour councillor Gill Mitchell, who chairs the committee, said: “There has been extensive public information and consultation to date on the Valley Gardens phase three project. We have taken on board the feedback provided and this has been used to develop the option further. “This is a significant opportunity to revitalise the Old Steine to Palace Pier area by improving the transport and public realm infrastructure.